Home » Blog » Insects » Cockroaches » How to get rid of cockroaches? Cockroaches are probably the most resilient pest/insect out there. They can thrive in very limited and basic conditions. In order for us to understand how do we get rid of cockroaches we first need to understand how do we attract cockroaches to our homes? Food stored in uncovered containers. They can survive in limited conditions and multiply very fast. Cockroach feces look like ground coffee or black pepper. A serious infestation may cause a pungent odor. Stomach problems that do not go away (specifically in kids). Getting rid of cockroaches is not as simple as just spraying insecticide or repellents. These pests can and will get into all things, they reproduce quickly and can survive for months without food and water. Cockroaches can be a struggle but with the right tools it can make the process of getting rid of them a bit easier. The best way to get rid of cockroaches would be with professional help. 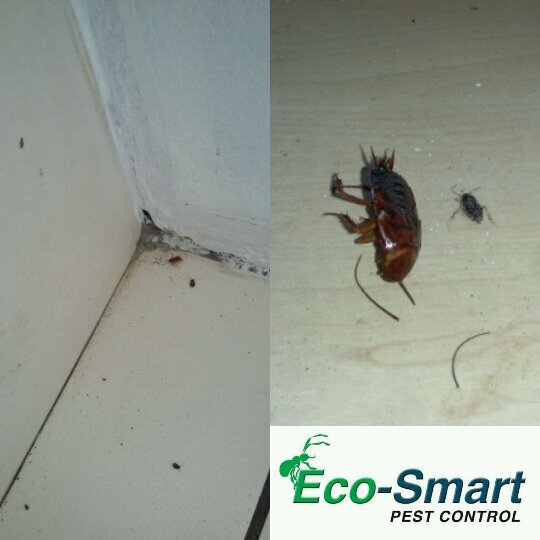 This professional help will be a qualified pest control agency like Eco-Smart Pest Control. Sanitizing and cleanliness is probably the most important step in preventing cockroaches. Hiring a Pest Control agent will render fruitless and a waste of your money if you do not keep your residence clean. You must remove the objects which attracts these pests to your home. Kitchen Appliances.These pests can live off the scrubs and grease left behind from dirty dishes or kitchen utensils. It is important to clean behind all large kitchen appliances regularly (fridges, freezer, stove, etc.). Store food in sealable containers.Cockroaches can get through small spaces and hence they can get into open packets of teabags, chips, rice, etc. Dine in one room.There is no dining in the TV room. Limit eating of various foods to one area in the house and areas where there are no carpets but tiles. This allows for quicker and more effective cleaning. More than washing dishes.Ensure that all counters and surface areas worked on are wiped down with cleaning and sanitizing detergent. Ensure that the microwave is cleaned out as well. Sweep or vacuum out the kitchen and dining area. Keep your trash bin covered and closed at all times. Repair leaking and running taps. Dry the basins, baths and showers before going to bed and put the plug back. Water dishes used by pets need to be stored correctly. Empty drip tray from under refrigerator. 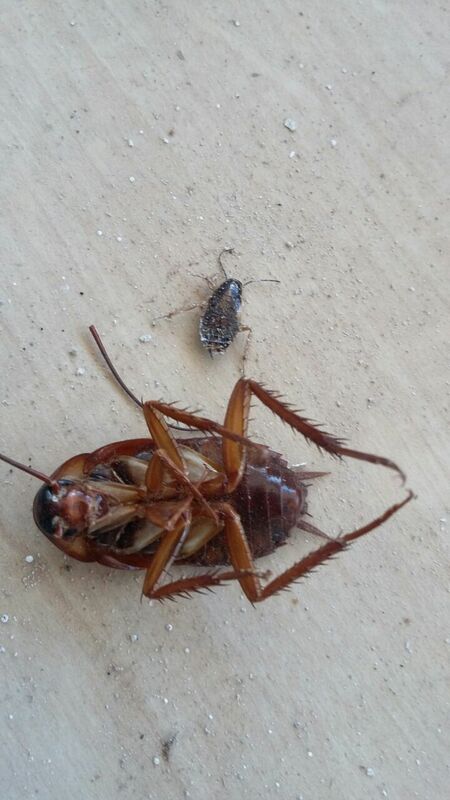 How to get rid of cockroaches is the reason you are still reading this blog. So below are a few home DIY remedies that can be used. Please note that most of these remedies might not have the desired affect and might not permanently remove the problem. Cockroaches despise the strong smell of bay leaves. This is a homemade repellent that will not kill them but dispel them from your home. Use a few handfuls of bay leaves. Grind them down to a fine powder. Sprinkle this powder in areas where cockroaches have been identified. Sugar attracts the cockroaches to eat the bait. The baking soda will damage and destroy the intestinal region of the cockroach. Combine equal amounts of sugar and baking soda. Sprinkle the mixture in different areas where cockroaches have been identified. Repeat the process if necessary. Cockroaches actually breathe through the center (abdominal region) of their bodies. Fabric softener will kill them by making it hard for them to breathe. Mix 2 part water with 3 parts fabric softener. Pour solution into a spray bottle. Apart from spraying this solution directly on cockroaches, you can also spray it into your zinc, basins, behind fridges, freezers, stoves, and furniture. Repeat the process as often as desired/required. Placing cucumber peels in aluminum cans produces a distinctive stench that can kill cockroaches like pesticide can. Place the cucumber peels in aluminum can. Place these cans in areas where you suspect cockroaches. Check cans after a few days. ← What attracts Termites to my home?